Any film buff visiting Charleston feels almost obligated to visit Boone Hall Plantation and Gardens. The silver lining is that visiting one of the most beautiful Charleston plantations certainly doesn’t feel like a chore. This antebellum era plantation is one of the oldest living, working plantations in the country. Boone Hall Plantation and Gardens is on Wampacheeoone Creek in Mount Pleasant. Mount Pleasant is across the Ravenel Bridge from Charleston, South Carolina. This historic plantation is about a ten mile drive from historic downtown Charleston. Like a big chunk of Charleston, it is listed on the National Register of Historic Places. Boone Hall Plantation and Gardens includes a huge Colonial Revival plantation home which replaced the first house on the site. 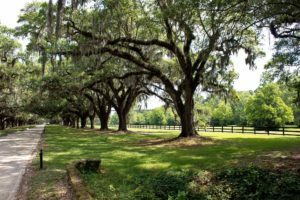 The site also includes flower gardens, some slave cabins, and the famed “Avenue of Oaks”. The Avenue of Oaks is a line of live oak trees along an almost one-mile drive to the house. The trees, which line both sides of the allee, were originally planted in the year 1743. Boone Hall Plantation’s history begins with the earliest reference to the site in 1681. Theophilus Patey gave a land grant of about 470 acres as a wedding gift to his daughter, Elizabeth, and her husband, Major John Boone, that year. These initial 470 acres are what started the site now known as Boone Hall Plantation and Gardens. The first wooden house was built in 1790. This house was a two-story, wooden building with a one-story porch in the front. The Boones focused on growing the cash crops of rice and indigo, a plant used to create blue dye in colonial America. The Boone family was heavily influential in Charleston as well as the founding of America. Two of Major John and Elizabeth Boone’s great-grandchildren, John and Edward Rutledge, were signers of the American Declaration of Independence. In 1817, the plantation was sold to two brothers, John and Henry Horlbeck. The brothers were prominent architects and builders in the Charleston area. The Horlbecks planted cotton on the plantation and expanded the hand-made brick-laying operation. The Laurel Hill Brickyard supplied bricks for many of the most famous historic buildings in the Charleston area. These bricks, cotton, and gin were not produced by the plantation owners themselves, of course. All products were made by the extensive numbers of slaves typically found on Southern plantations at the time. On the plantation today sit nine of the first slave cabins on the plantation. Most can be dated back to 1790-1810. These slave cottages are normally found along the drive to the plantation home. This was intentional. Having your slaves’ quarters lining the front drive is akin to the modern-day displays of expensive cars or other forms of wealth. During and after the Civil War, the Horlbecks shifted production from cotton to pecan trees. By the early 1900s, Boone Hall Plantation was the largest producer of pecans in America. Who Owns Boone Hall Plantation and Gardens? 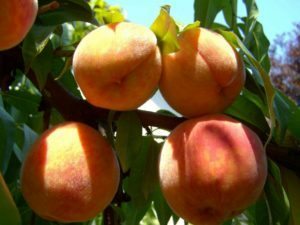 In the 20th Century, Boone Hall Plantation and Gardens shifted hands from several different families. First Thomas and Alexandra Stone purchased the plantation in the early Twentieth Century. Dimitri and Audrey Djordjadze bought the plantation in 1940. They lived there for 5 years before selling it to the current family that owns it, the McRae’s. A smoke house is also still present on the property, which can be dated back to 1750. The Cotton Gin House, constructed in 1853, is still standing, though barely. It was used as a restaurant until the building was deemed structurally unsound and not safe to enter. Today, it sits, heavily supported. And there it will wait for an infusion of funds to repair it before the elements or an earthquake provide the final blow to its structure. The first seedlings of the afore-mentioned Avenue of Oaks were first planted by Captain Thomas Boone, son of Major John and Elizabeth Boone, in 1743. The oak allee was not completed until 1843 by the Horlbeck family. These live oak trees are huge and cover the entrance down to the front house gates. The house which now stands was constructed by Thomas Stone. He was a Canadian ambassador that purchased the land in 1935. He preferred a “grander style” house to the original home built on the property in the 1700s. As such, he constructed the Revival-style house which stands there today. Many of the bricks used in the construction of the house were extracted from the Horlbeck brickyard, located on the property. Tour guides are happy to point-out filmed locations on the property. One of the most obvious is a set constructed for and abandoned immediately after the filming of Queen. The Avenue of Oaks does seem reminiscent of the film, Gone with the Wind. In reality, Boone Hall’s allee inspired the set that was constructed in California for the iconic film. 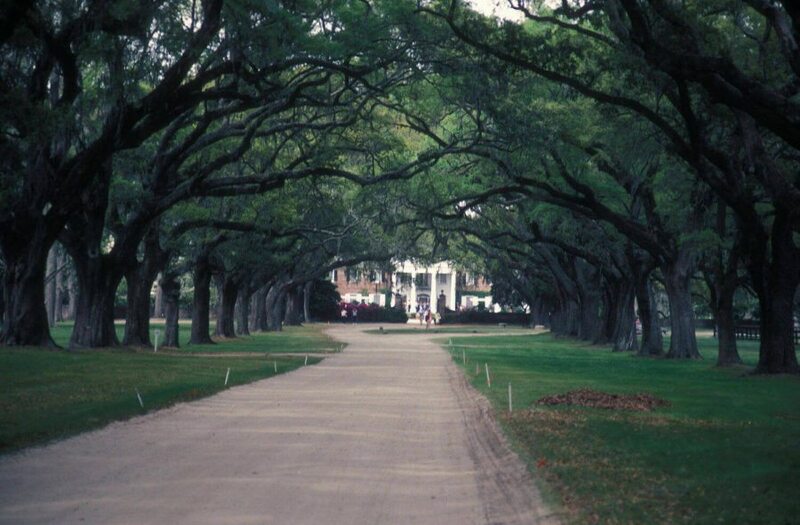 Tom Hanks was originally supposed to run down the Avenue of Oaks at Boone Hall Plantation for the film Forrest Gump. Before filming, he refused when he saw how long of a run it would be. A shorter one was found at a plantation near Savannah, Georgia. Fans of Forrest Gump would do well to visit Boone Hall to get the feel before exploring filming sites in Savannah. A top spot includes the location of the Forrest Gump bench. 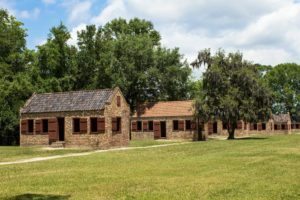 Grab a Boone Hall Plantation map to get here and explore more easily. You can also simply enjoy the various tours offered around the property. Visitors are welcome to take a guided Boone Hall Plantation House Tour during their visit. The tour is about thirty minutes and gives the history of the house and all the previous owners of the property. The old gigantic oak trees covered with Spanish moss make the Avenue of Oaks one of the most beautiful backdrops for a wedding party. The oak branches create a perfect canopy over wedding guests during the ceremony. Walking under them any time of year is fairly pleasant. That includes even the muggiest of Charleston summer days. 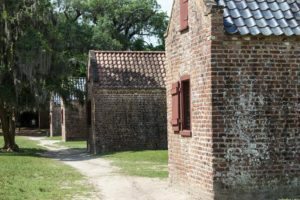 The Boone Hall Slavery Exhibit is open year-round for visitors to this site. It was declared one of the most important African-American Historic Places in South Carolina. The exhibit is situated in several of the old slave cottages. It consists of life-size figures and audiovisual presentations. The exhibit of the African-American experience at Boone Hall Plantation has won awards for its emotionally powerful presentation. Gullah performances are often offered close to the African-American history exhibit. The farms are the oldest surviving colonial farm and is still producing crops. It also has a farmers market which was opened in 2006. If you’re interested, it’s located across Route 17 from the farm. This dock is ideal for wedding ceremonies. It was the venue for the celebrity wedding of Ryan Reynolds and Blake Lively. Even if you’re not getting married, this iconic structure overlooking the surrounding tidal marsh is still fantastic for a photo opportunity. The plantation spans 738 acres of Lowcountry landscape. 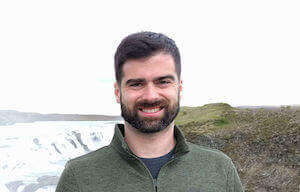 It includes naturally preserved wetlands, seasonal crop fields, ponds, and creeks. Other attractions include the Butterfly Pavilion. There, visitors can see butterflies in various stages of their lifecycles. It costs $4,500.00 to use the Cotton Dock and – $3,000.00 to use the front lawn. The back lawn costs $3,000.00, and the Pavilion costs $2,000.00 while the creekside costs $1,500.00. To explore the possibilities yourself, be sure to contact Natalie Knox at Boone Hall Plantation. Boone House Plantation is located at 1235 Long Point Rd, Mt Pleasant, SC 29464. Check the website for Boone Hall Plantation & Gardens hours, as they change throughout the year. If you’re hungry during your visit, there is a snack bar and small souvenir shop. Boone Hall Plantation tickets are $20 for adults, $10 for children 6 to 12, and free for children under 6 years of age. It’s actually the least-expensive of the Charleston plantations, last I checked. This October event features four terrifying attractions all on the plantation premises. Previous years’ Fright Night attractions included: the psycho clowns in 3D, Terror Trail hayride, Nightmare Manor, Horror High, and a zombie-infested town. It was a major bummer when they cancelled this event for Halloween 2016. That said, they’re promising a better event in 2017. During the Christmas season, the plantation is decorated and adorned with ornaments. Previous Boone Hall Christmas attractions included Christmas Town, Santa’s castle and holiday hayride. This particular event is a popular one in Charleston. The Wine Under the Oaks event always features live entertainment, delicious Charleston food, a champagne tent, ice sculptures and, of course, good wine. This festival is the largest oyster festival in the world and features oyster eating and oyster shucking contests. Visitors are not permitted to take photos of the house, but there are plenty of opportunities to snap a few while you’re visiting. The only way to truly understand why Boone Hall Plantation and Gardens is the most photographed plantation in the South is to see it. Visit the Boone Hall website photo gallery to get a feel for the property. A Palladian 18th-century plantation home, Drayton Hall is a landmark in Charleston. It is well-known as one of only three in the Charleston area that survived both American wars (the Civil and Revolutionary Wars). This beautiful plantation is located on Ashley River and is open daily for tours. Highlights of Magnolia Plantation include the extensive gardens. This is the first recorded site of azaleas in North America. This national park preserves a part of the Snee Plantation of Charles Pinckney. Charles Pinckney was a signer of the American Constitution and South Carolina governor. It’s also across the road from the entrance to Boone Hall (and quite a bit cheaper, though there’s not as much to do here). This plantation houses America’s Oldest Landscaped Gardens. Beautiful flowers include camellias that are over a hundred years old, magnolias and roses and many more. The sweeping view of the Ashley River from the butterfly ponds that separate the Middleton Place house and gardens from the river is breathtaking. 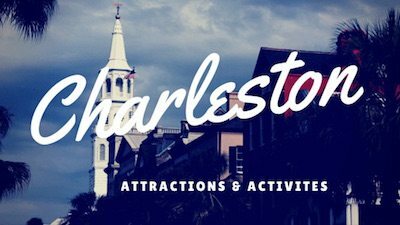 And be sure to explore more of the Best of Hipster Charleston website to learn all the best activities and things to do in Charleston, SC!